At first glance, the trailer I saw left me with some high expectations as a bombardment of action is present throughout the clip. I’ve seen tons of action movies with a variety of visceral action scenes but the biggest question I had after viewing the trailer was, what was going to make Atomic Blonde different or more entertaining? The film is set in 1989 during the fall of the Berlin Wall. Our would-be heroine has been tasked to recover a list of the world’s known spies before it falls into the wrong hands. In this regard, the plot is reminiscent of the first Mission Impossible. The movie is based on the graphic novel The Coldest City by Antony Johnson. The “coldest” relates to the city of Berlin where the Cold War lived the hardest in Berlin at the time. Lorraine Broughton seemingly has no ties to Berlin so she should be the perfect double agent to go in and recover the list. This said list happens to be carried by a Russian defector, which allows the narrative to delve a little deeper than your normal run-and-gun spy movies. Charlize Theron fully embraces the title role within this film and it shows, but that may be because she holds an executive producer credit to her name. I’m in the opinion that Charlize is a classical Hollywood beauty. She has the grace of Jane Mansfield and Grace Kelly, even when she’s getting the snot beat out of her. Her physical tolerance is quite evident in several scenes of the movie. While the long ice baths had to be daunting on her endurance, it has to be the seven-minute fight scene in the stairwell that takes the cake as it had to be completed in one continuous shot. She really doesn’t have much to prove considering the solid work in not only Atomic Blonde, but other action-packed thrillers like Mad Max. She makes the perfect Atomic Blonde. James McAvoy also joins the cast as a fellow cloak and dagger member. His presence is always welcome in any comic book type roll. This role is a perfect example of how sleazy he can be in the right situation. I believe a large part of the selling of his underhanded character comes from his previous work in M. Night Shyamalan’s Split. The supporting cast does an excellent job of either helping or hindering Lorraine. The cast includes Eddie Marsen (Sherlock Holmes), Toby Jones (Captain America:The First Avenger), Sofia Boutella (The Mummy) and the welcome sight of John Goodman. Lastly, James Faulkner (Game of Thrones) who appears as Cheif C. Faulkner, made a huge impression simply because his voice was so outstanding and respectful. It’s like his voice spoke for the times, commanding and dominant to a point where a voice alone could rock you to your core, like strict principal that you were always afraid to piss off. Any respectable/decent action has a style that suits it’s tone or time. Atomic Blonde is a modern film that has an 80’s style but borrows things from other movies, such as John Wick, which makes sense as the film is directed by David Leitch. Leitch is more widely known for his work as a stuntman and associate director, so seeing him take the reigns and direct the fast-paced action seems to work in his favor for Atomic Blonde. The action is physical and by all means painful to any person on the receiving end of the punishment. What helps the action even more is the 80’s soundtrack that works spectacularly in every scene, drawing the audience into late 80’s Germany. What adds even more to the screen is the fact that the soundtrack’s classic hits are covered in German. The authenticity of Berlin is cemented with tiny details that showcase the coldness and unfeeling nature of the setting like the graffiti that is spray painted showcasing the tension of the time. The core of the film is a spy caper that has a series of twists and turns to make us continue to guess who is good and who is bad. You can’t always justify the actions of spies and the countries that guide their actions but you are happy to tag along for the ride. In the end, should you go see this movie? 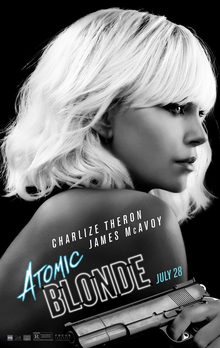 Atomic Blonde is a fantastic action movie with in your face characters and some stereotypical tropes that are essential to a “spy” movie. Charlize Theron makes the story come off the page. She gives us a character with mysterious past and plenty of damage to go with her. This is a story at a time when the world was ready to blow itself up but tore down its issues, both figuratively and literally, in the form of the Berlin Wall. This film definitely earns its hard R rating but for a movie that is designed to be a “take no prisoners” action film, this is a good thing. Get out there and see this film before it’s a memory of the 80’s.